Your batteries may be ticking time bombs, according to organizers behind "Avoid the Spark," a new nationwide campaign launched in California to teach consumers how to properly store and dispose of batteries. Technology, a hallmark of modern life, brings with it the good and the bad, and some of that bad comes in the form of improperly stored batteries. They're blamed for the majority of fires at 26 waste facilities throughout California. And with 95 percent of Americans owning a cellphone and nearly half owning portable tablets, battery use will only increase. Yet, according to nonprofit Call2Recycle, a North American battery recycling program, many consumers do not know how to properly handle their batteries once they reach the end of their useful lives. A Nielsen survey commissioned by the group in 2016 found that 60 percent of consumers simply tossed out at least some of their single-use batteries, while 15 percent did the same with rechargeable batteries. Of special concern are lithium batteries, the battery of choice for many cellphones, cameras, and computers. Call2Recycle's Carl Smith tells ABC affiliate KGO-TV. "Even a perfectly fine laptop battery that is no longer useful can be potentially dangerous if not handled correctly at the end of life." says Carl Smith, CEO and president of the not-for-profit, Call2Recycle, the country's largest battery recycling program. He says if a lithium battery comes into contact with metal in just the right way, sparks can fly. "They look like fire crackers going off," Smith said. To avoid this risk, the group says consumers should use non-conductive duct tape or clear packing tape to cover the terminals of lithium-based batteries. Consumers should also avoid storing batteries together, which can lead to a potential explosion and exposure to hazardous materials. That's because the batteries can form and release hydrogen, a highly volatile gas that could be ignited by elevated temperatures or static electricity, according to a study commissioned by the California Integrated Waste Management Board. "The accumulation of hydrogen gas can be avoided if batteries are stored in ventilated containers and/or not allowed to make physical contact [with each other]," says the report. 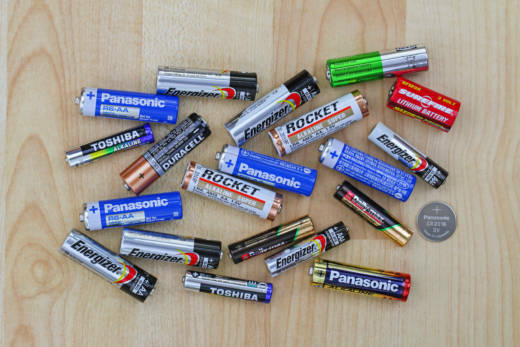 More tips on how to store and dispose of batteries are posted at the Call2Recycle website, along with a list of drop-off locations in the Bay Area for those wishing to dispose of their batteries.